C&J Rentals' framed structure marquee, when compared to the Epic marquee, has no guy ropes or centre poles which allows maximum uninhibited space. The framed marquee is perfect for events such as conferences, exhibitions and larger social gatherings. They also have the added advantage of being easy to construct in smaller spaces and hard terrain. At C&J Rentals, we can also build on hexaganol ends giving an otherwise simple marquee design a glamorous twist. 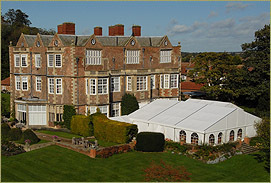 We stock a number of framed tents which can accommodate a capacity of 50 to 1,000 guests. 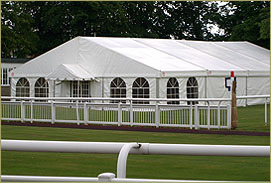 In addition, C&J Rentals offers long term hire options to use our framed marquees as temporary warehousing. At C & J Rentals we do our best to ensure that your needs are met with our products and our Framed marquees have proved extremely popular with clients and their guests. For any enquiries about hiring one of our framed marquees or to request more details please feel free to contact us.